The eighteenth Mega Match This qualifier of the 2018 qualifier campaign saw a return to the ever-popular Glebe Fishery in Leicestershire. As expected, this third of four qualifiers at the venue produced some truly epic sport, despite a slow start, with red hot temperatures, bright sunshine and cloudless skies all doing their best to hamper angler’s efforts on the day. In all, there were a total of thirty two (32) weights in excess of 100lbs with some of those failing to compete for their section! Andy’s 200lb plus catch see’s him through to his third consecutive Mega Match This final at Maver Hayfield Lakes. Winner on the day with a total weight of 236-02-00 was Preston Innovations backed, Andy Power. Drawn on Pool 5, peg 80 in the middle of the section, Andy initially started on the pellet waggler to find a few early fish before switching to his short line at 4 metres feeding pellet with pellet on the hook. It was a move that paid dividends with carp up to 7lbs regularly coming to the net which saw Andy take charge of the match and finish over 42lbs in front of the chasing pack. Andy also books his place in August’s British Pole Championship final in the process. Second place on the day was taken by Marc Rodger (Marukyu / Mosella UK / Baits 2 Fish). Marc drew end peg 86 on pool 6 and started on the long pole but struggled to keep hold of the fish. Marc quickly switched to his 5 metre line along his left side edge and opted to concentrate his efforts there for most of the match. Feeding pellet and using 6mm pellet on the hook, he landed carp to 8lb to finish the match with 193-09-00. Third place went to Rotherham-based man, Nick Smith. Nick drew peg 1 on pool 1 and was forced to incorporate a number of methods in order to try and keep hold of the fish. 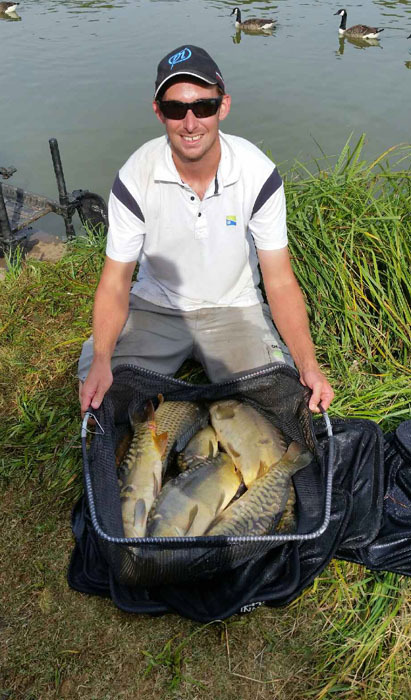 Alternating between pole, pellet waggler and feeder tactics, Nick was able to pick up odd fish where he could to amass a total weight of 192-00-00 of carp to 5lb and F1’s. Nick also books his place in this year’s Maver British Pole Championship final.